Lirum Device Info for iPhone is a handy application to retrieve real time status of your device. For example, it let you check how the memory is being allocated at a given moment or check on the battery life. It is a great reference tool for any user who wishes to look up specifications constantly. Lirum Device Info – System Monitor, Profiler and Diagnostic Tool iPhone app can be downloaded for $2.99 from iTunes App Store. Lirum Device Info app let you monitor your iPhone’s performance, compare its specifications with other models and watch feedback from your device’s sensors (magnetometer, accelerometer, gyroscope, GPS). When you launch Lirum Device Info for iPhone, the general screen shows your phone’s storage, along with the current ratio of free to used space and model number of your iPhone. 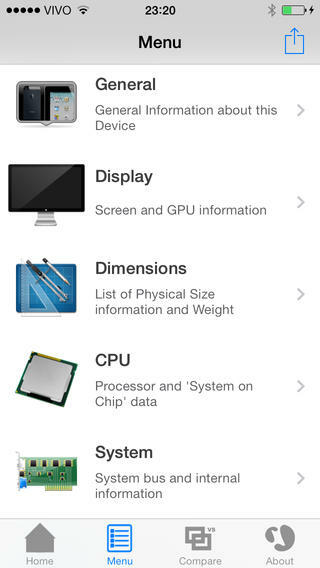 From the main menu, you can check your iPhone’s display, connectivity, CPU, camera, battery and hardware data. The compare screen feature let you compare your phone’s screen feature with an older version of iPhone. This feature comes handy in case you’re thinking of upgrading your iPhone or is just curious to find out how far the current device has come since its first version in 2007. Other features of Lirum Device Info iPhone app include Netstat like tool, displaying all network connections of the device, Memory allocation graph with “Force Memory Release” option; Touchscreen/LCD Color and Contrast tests; detailed CPU information; Operating and Non operating Temperatures; relative humidity and SAR values, to name some of its major features. You may refer to the developer website to learn the complete set of features offered by Lirum Device Info app. The UI is well designed and easy to use. The app is compatible with iOS versions 6.0 or later. If you are a tech junkie who loves to find out hardware and software info and other specs of your iPhone, perhaps Lirum Device Info app is for you. It provides lots of tech data about your iPhone in simplest of terms. The menu is user friendly. The UI is well designed and easy to comprehend for most parts. Only downside with the app is that it is not meant for the common man who might not be much interested in finding out what is under the hood of your iPhone. The info it provides is highly technical. Check Lirum Device Info out if you want to see your iPhone specs in little more detail.